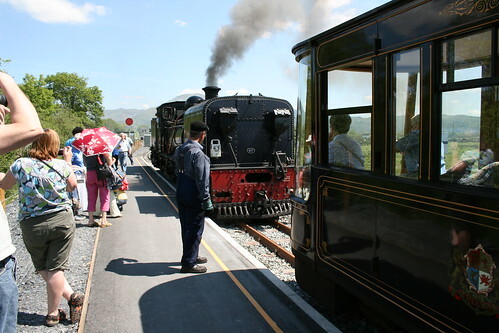 On Wednesday we finally got to our proper journey on the Welsh Highland Railway, from Rhyd Ddu down to Pont Croesor. 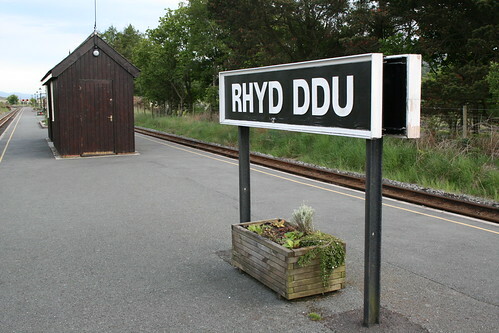 The latest extension across the farmland reclaimed from the Glaslyn estuary has only recently opened, and brings the railway within a tantalising three miles of Porthmadog. At £18.50 to travel only half the length of the open line (the full journey is £28.00) we hoped it would be worth it! From an enthusiast point of view I would say it definitely is! An hour each way behind a pristine NGG16 Garratt, and glorious weather combined with the semi-open coach, led to a happy blogger. The frequent sharp reverse curves also give a great view of the rest of the train as well as the magnificent scenery. As a family activity, I would say it’s questionable depending on your budget and tolerance of long train journeys. At least the modern coaches are spacious and comfortable; my wife’s #1 complaint about more “authentic” heritage railways is usually the wooden-seated stock. Complaint #2 is that a preserved railway often “doesn’t go anywhere”. While this is still partially true of the incomplete WHR (although there is the RSPB osprey sanctuary at Pont Croesor, a better situation than the nothing at all at previous terminus Hafod-y-Lyn) it seemed that Beddgelert was a popular destination for many of our fellow travellers and given the parking situation in the town it does makes sense to take the train there. 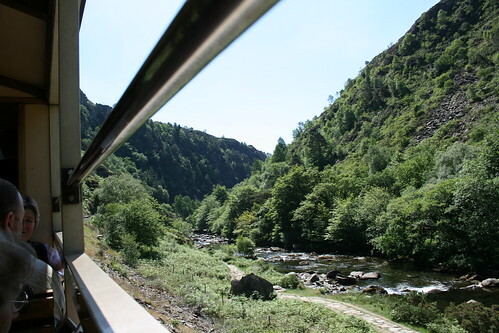 Of course below Beddgelert is the spectacular Aberglaslyn Pass, remarkably difficult to photograph from on-board so aside from a couple of token shots I was happy to sit back and take it in without the hindrance of the camera lens. 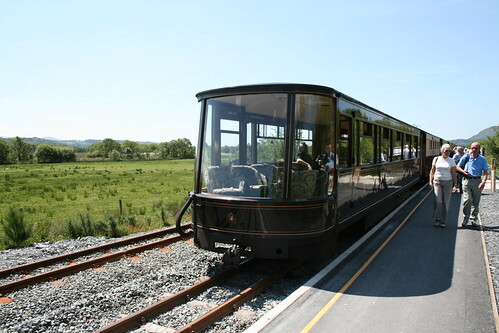 Unless you do fancy a bit of bird watching or a hike to Porthmadog, at Pont Croesor there isn’t much to do except watch the loco run round and gaze admiringly at the armchairs in the beautiful Pullman observation coach. The train was rather fully loaded, with a few people trying to start their journey there turned away. 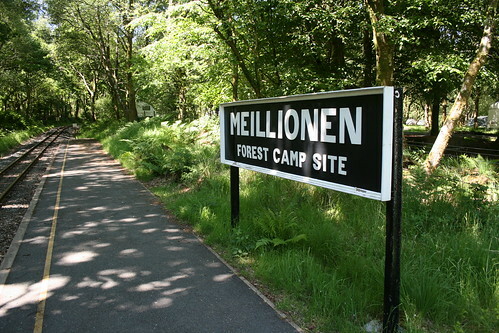 On the return journey we aligned at Meillionen, a halt just north of the Beddgelert reverse curves serving the popular forest camp site. My sister and her husband were staying there in their caravan, so we enjoyed a sun kissed barbeque before catching the next train back up to Rhyd Ddu. Or at least that was the plan. In the end, after waiting at the halt for a while after lunch and then realising that we hadn’t heard the diesel-hauled second train of the timetable running downhill earlier, we had to switch to Plan B and drive back. When we all finally returned to the cottage we heard the next steam service approaching, over 30 minutes late. So what happened to that diesel train remains a mystery! 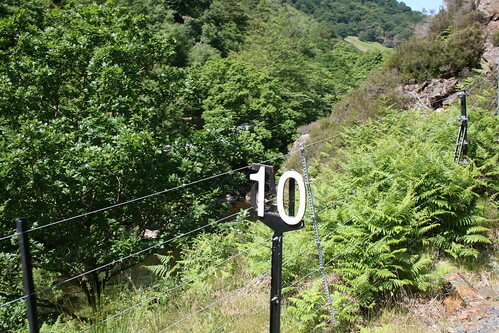 This entry was posted in 2' gauge, garratt, narrow gauge, photos, preservation, welsh highland railway. Bookmark the permalink.